While we all agree that many of these examples look indistinguishable from spirit orbs, keep in mind that we caused the conditions necessary to obtain these photos. We first need to avoid many of these conditions on investigations and our protocols help to do that. One of the things we all can draw from this experiment is how it is necessary to discard many of our "good" positive photos because there simply may be some contamination that could have caused the orbs. In normal circumstances and with the conditions right, there are still spirit orbs that cannot be explained by natural causes. In addition, this is why we put more credibility in photos that occur simultaneously with other positive events such as EMF readings, temperature drops, psychic impressions, etc. 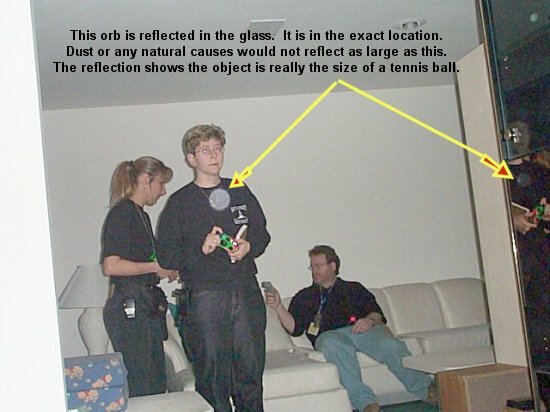 To start off and keep us all grounded somewhat, here is a orb photo that does prove some orbs are unexplainable.